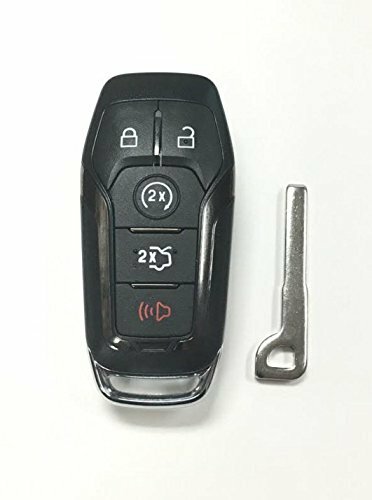 THIS AD IS FOR A 5 BUTTON OEM NEW CONDITION FORD MUSTANG SMART PROXIMITY KEYLESS REMOTE. PART#164R8119. YOU MUST BE SURE THIS IS THE PART# YOU NEED PRIOR TO PURCHASE. THIS REMOTE WILL NEED TO BE PROGRAMMED BY A LOCKSMITH OR DEALER. IT WILL INCLUDE THE UNCUT EMERGENCY KEY LISTED IN THE PICTURE. THIS FITS THE 2015-16 FORD MUSTANG WITH PUSH BUTTON START IGNITION. AGAIN PLEASE BE SURE THIS IS THE REMOTE YOU NEED. THIS IS FOR THE PUSH BUTTON START MUSTANGS. INCLUDES UNCUT EMERGENCY KEY. IT MUST BE CUT TO MATCH YOUR EXISTING KEY.